TOKYO (Reuters) – Japan stopped highly radioactive water leaking into the sea on Wednesday from a crippled nuclear plant and acknowledged it could have given more information to neighboring countries about contamination in the ocean. Despite the breakthrough in plugging the leak at the Fukushima Daiichi power plant, engineers need to pump 11.5 million liters (11,500 tons) of contaminated water back into the ocean because they have run out of storage space at the facility. The water was used to cool over-heated fuel rods. “The leaks were slowed yesterday after we injected a mixture of liquid glass and a hardening agent and it has now stopped,” a TEPCO spokesman told Reuters. Neighbors South Korea and China are getting concerned about the world’s worst nuclear disaster since Chernobyl in 1986, and the radioactive water being pumped into the sea, newspapers reported. “We are instructing the trade and foreign ministries to work better together so that detailed explanations are supplied especially to neighboring countries,” Chief Cabinet Secretary Yukio Edano told a news conference on Wednesday. “The original amount of radioactivity is very low, and when you dilute this with a huge body of water, the final levels will be even lower than legal limits,” said Pradip Deb, senior lecturer in Medical Radiations at the School of Medical Sciences, Royal Melbourne Institute of Technology University. Workers are struggling to restart cooling pumps — which recycle the water — in four damaged reactors. “What they are going to have to release is likely to be highly radioactive. The situation could politically be very ugly in a week,” said Murray Jennex at San Diego State University, who specializes in nuclear containment. Japan is facing its worst crisis since World War Two after the 9.0 magnitude earthquake and tsunami left nearly 28,000 people dead or missing and thousands homeless, and rocked the world’s third-largest economy. The two Fukushima plants together provide four percent of Japan’s electric power. “Nuclear power plants can run only with local consent. I see it as being quite difficult to resume operations,” said Masayoshi Yoshino of the Liberal Democratic Party. The key to bringing the reactors under control is the extent of damage to the plant’s cooling system, said analysts. “To put the Fukushima nuclear catastrophe in perspective, Chernobyl involved a single operating reactor core,” said Kevin Kamps from Beyond Nuclear, a U.S. radioactive waste watchdog. “Fukushima Daiichi now involves three reactors in various stages of meltdown and containment breach, and multiple (spent fuel storage) pools at risk of fire,” said Kamps. The world’s costliest natural disaster has hit Japan’s economy, left a damages bill which may top $300 billion, and forced the heavily indebted country to plan an extra budget. Rolling power blackouts have hit global supply chains, with the world’s largest automaker, Toyota Motor Corp, idling local plants and saying it will suspend some U.S. plants also. SENDAI, Japan (AFP) – Japanese crews grappling with the world’s worst nuclear incident since Chernobyl suspended work due to radiation fears Wednesday as tens of thousands in need after the quake and tsunami desperately appealed for help. The jittery nation, living in dread of a nuclear catastrophe after Friday’s twin disaster, was also hit by a strong 6.0 magnitude earthquake that swayed buildings in Tokyo, fraying already jangled nerves. The official toll of the dead and missing after the quake and tsunami flattened Japan’s northeast coast has topped 11,000, with 3,676 confirmed killed, police said. However, after the Tokyo stock exchange’s biggest two-day sell-off in 24 years sparked a global market rout, the headline Nikkei share index closed up 5.68 percent on bargain hunting. The evacuation order at the Fukushima nuclear power plant came as a tall white cloud was seen billowing high into the sky over the stricken complex. “Around 10:40 am (0140 GMT) we ordered the evacuation of workers… due to the rise in (radioactivity) data around the gate” of the ageing plant, a nuclear safety agency official said at a televised news conference. Several hours later there was no news on whether the crews had been allowed back into the plant 250 kilometres (155 miles) northeast of Tokyo. Before the evacuation order, crews at Fukushima — who have been hailed as heroes — contended with a new fire and feared damage to the vessel containing one of the plant’s six reactor cores. A Japanese military helicopter was on its way to dump water on the stricken nuclear plant to help contain the overheating. The containment vessel around the core of reactor number three may have suffered damage, and the “likeliest possibility” for the white cloud was steam escaping from the vessel, chief government spokesman Yukio Edano said. 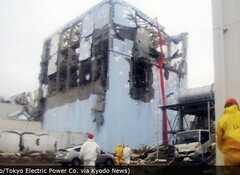 Engineers have been desperately battling a feared meltdown at the 40-year-old plant since the earthquake and tsunami knocked out cooling systems and fuel rods began overheating. France’s Nuclear Safety Authority said the disaster now equated to a six on the seven-point international scale for nuclear accidents, ranking the crisis second only in gravity to the level-seven Chernobyl disaster in 1986. The head of the UN’s atomic watchdog said that unlike Chernobyl, the Fukushima reactors have primary containment vessels and had also shut down automatically when the earthquake hit, so there was no chain reaction going on. The full tragedy of the quake and tsunami was meanwhile playing out as more details emerge of the staggering death and devastation in the worst-hit northeast. The small fishing town of Minamisanriku, for example, is believed to be missing about half of its 17,000 people. “Ten of my relatives are missing. I haven’t been able to get in contact with them,” 54-year-old Minamisanriku resident Tomeko Sato, who lost her house in the disaster, told AFP. Millions have been left without water, electricity, fuel or enough food and hundreds of thousands more are homeless, stoically coping with freezing cold and wet conditions in the northeast. Aomori governor Shingo Mimura said he desperately needed central government assistance to get hold of oil and relief supplies. “We cannot possibly get out to rescue survivors nor reconstruct the devastated areas without oil. Just a tiny bit of oil for today can protect lives,” he said. “There are a variety of problems, such as shortages of water, food and blankets as well as difficulties in delivering supplies,” added Ryu Matsumoto, state minister in charge of disaster management. With nerves on edge across the world’s third-biggest economy and beyond, people across Asia have been stripping shelves of essentials for fear of a major emission of radiation from the power plant on the east coast. The government has warned that panic buying in towns and cities that have not been directly affected by the twin disasters could hurt its ability to provide aid to the devastated areas. Edano, who is the chief cabinet secretary, said Japan as a whole was amply provided with fuel but stressed that petrol and kerosene were “very short” in the ravaged northeast. “Those who do not live in disaster-hit areas, please do not buy (fuel) in bulk. We have enough to meet the nationwide demand,” he said, adding that the government was doing its all to get fuel to the north. The normally heaving streets and subways of Tokyo were quieter than usual on Wednesday morning. The number of people sporting paper face masks has shot up, although the masks offer no real protection against radiation. Radiation levels in the capital’s vast urban sprawl of 30 million people have see-sawed without ever reaching harmful levels, according to the government. But it has warned people living up to 10 kilometres (six miles) beyond a 20-kilometre exclusion zone around the Fukushima plant to stay indoors. More than 200,000 people have already been evacuated from the zone. President Barack Obama, who has dispatched a naval flotilla led by a US aircraft carrier to aid in the quake-tsunami rescue operation, said he was “deeply worried” about the potential human cost of the disaster in Japan. Obama also vowed to “further improve” the safety of US atomic facilities, while several European nations announced reviews of their own nuclear installations and Germany temporarily shut down seven reactors. Hoax emails and text messages warning of radiation drifting south from Japan have set off a run on essentials such as bottled water and fresh milk in places as far afield as the Philippines.